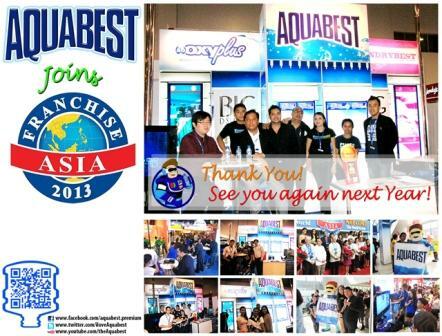 Aquabest, the country’s leading water refilling franchise is proud of its success at the recent 2013 Franchise Asia Philippines. The company is a long time member of the Philippine Franchise Association and is considered to be among the leading players in the water franchising industry. The company highlighted its 3 in 1 Combostore and its new EntrepRises concept at the show. EntrepRises is the Aquabest 3 in 1 Combostore enhanced by the option to add on a concept to create a complete franchise package. The Combostore franchise integrates three tried, tested, and successful concepts into one. Bundled in the package are GQWEST’s Aquabest, Laundrybest, and Oxyplus brands. Aquabest is the company’s flagship brand, which is shifting to offer structured water. Laundrybest is the company’s Laundromat franchise, while Oxyplus is their oxygenated alkaline water brand. Now, the company has sought to further build upon its success by giving franchisees complementary businesses to further increase their service offerings. The add-on service is the Best Mobile Wazzers the country’s first carwash delivery. These concepts are designed to be complementary and will address the needs of the communities they are located in. The combination of all these concepts would allow franchisees to benefit from the synergies from these complimentary concepts. The company says that it is currently focusing on provincial expansion as the market has much potential to drive the company’s growth “We are looking at the possibility further expanding in provincial areas where because of rapid development, our commitment to added value and quality service will help us penetrate these emerging markets. “says Carson Tan CEO of GQWEST Inc the mother company of Aquabest.